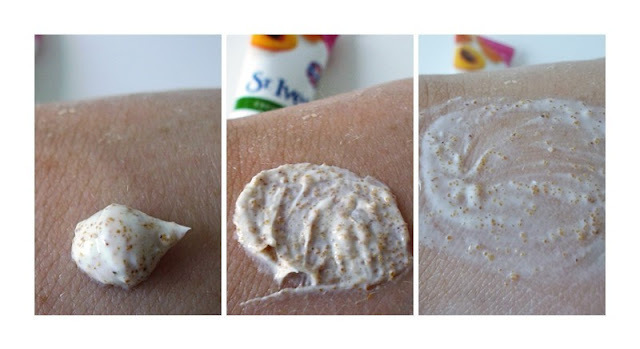 I’ve been using a little 30ml sample (quite a large sample really) of St. Ives Apricot Scrub for the past few months on and off. I received this sample through Facebook, but i found about the offer through studentbeans.com. I really recommend signing up if you’re a student as every couple of weeks ( i think) they send you an e-mail with the latest offers and most of the time there are some free samples to claim in there too. I got this through that e-mail, i then clicked on the link and it took me to the Facebook page for St.Ives, i filled out some details expecting a sachet sample or something and a couple of weeks later it arrived in the post and it was a lovely 30ml sample (which retails for 99p!) It also came with a £1 off coupon! I have been using this scrub on and off, maybe once a week, when i feel like my skin needs a nice exfoliate, i use the Liz Earle Cleanse and Polish which really really mildly exfoliates, but this is more my proper exfoliator! I got the apricot Scrub which is targeted towards all skin types, aiming to be invigorating and to create fresh skin. It claims to be oil free with 100% natural exfoliants which sounds good to me! I like the smell, it smells lovely and apricoty and fruity. It claims to ‘gently exfoliate dull surface cells to instantly reveal smooth, radiant skin’. I would say this claim is correct. Everytime after i use this my skin feels glowy, doesn’t feel tight, and feels oh so soft and when i go to put on my moisturiser it sinks in instantly! And when i apply my foundation or just concealer afterwards, it looks flawless! (L-R): A Pea sized amount of scrub, scrub rubbed in with no water, scrub with water. Directions on the back say to ‘Moisten face with water. Dispense product onto fingertips and massage over face. Rinse with water’, which is what i do with scrubs anyway aha. Although i do like to leave the scrub on my face for a few minutes, sort of like a face mask. I initially worried about my sensitive skin, but so far i have had no problems, it has just made my skin look healthy, glowy and made it feel SOO soft! I believe there are 4 types of different facial scrubs, an Invigorating scrub, a Renew and Firm scrub, a Blemish Fighting scrub and a Gentle scrub, these are all currently on offer for about half price in Superdrug at the moment but normally retail for up to £5 for 150ml of lovely product. This little tube has lasted me forever, so one massive 150ml would last a fair while too (depends how often you use it). I only like to use an exfoliator once a week, maybe twice if my skins playing up. Although on the back of the tube it suggests to use it 3-4 times a week which seems as though it would be a bit too harsh for the skin. I give this product 5 Sophie Hearts! I didn’t realise how large the St. Ives range is and I really want to try out the St. Ives Invigorating all over body scrub now! Have any of you tried any of the St. Ives scrubs? Previous Post Updates and How to contact me!